Other contaminants commonly found in our single stream recycling are “tanglers” (e.g. garden hoses, metal hangers, clothing, wires, holiday lights, etc. ), food waste, styrofoam and metal sharps or needles. These items are not recyclable in your home recycling bin, but there are other places where these items can be dropped off. 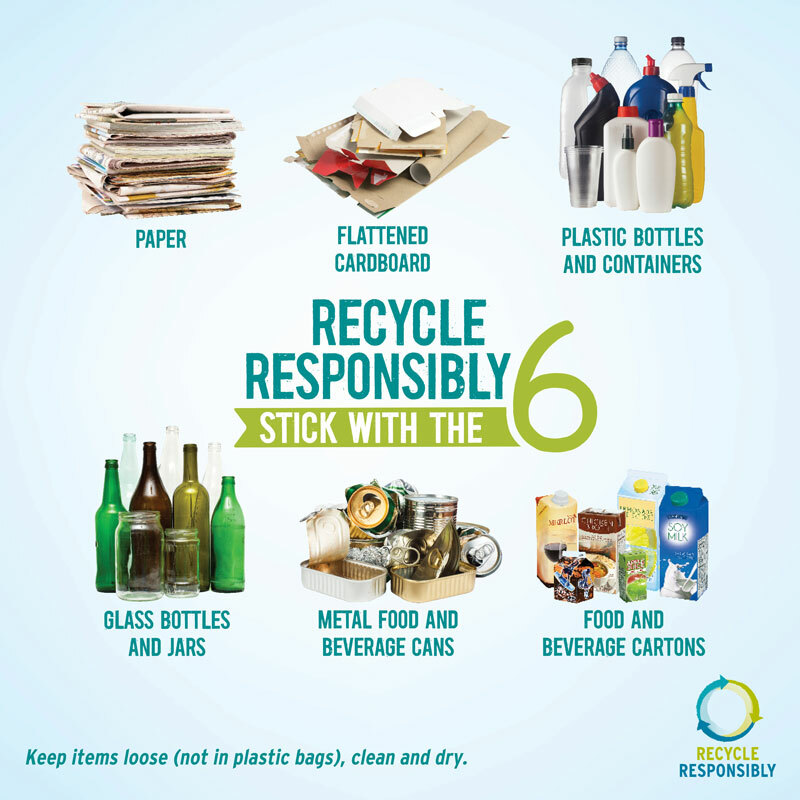 It’s easy to reduce contamination if you simply “Stick with the Six” items that should always go in your recycling bin. To find out where to recycle or donate other items not shown on the list, visit RecycleResponsibly.org. On this website, residents can learn more about the campaign and access a regional recycling database hosted by Saint Louis City Recycles (STLCityRecycles.com). This searchable database houses a number of places that accept items for recycling or donation, such as clothing, electronics, household hazardous waste and more. The Recycle Responsibly education campaign stems from the Materials and Recycling Working Group of OneSTL. OneSTL is a regional initiative that focuses on a sustainable future for the St. Louis region. Follow @OneSTL on Facebook to stay up-to-date with the latest about Recycle Responsibly. The Working Group includes the following entities: East-West Gateway Council of Governments, St. Louis-Jefferson Solid Waste Management District, City of St. Louis, St. Louis County, Jefferson County, Madison County, City of University City, Brightside St. Louis, Saint Louis City Recycles, EarthWays Center of Missouri Botanical Garden, Republic Services, St. Louis Composting, Earthday365, Green Dining Alliance, Recycling on the Go, University of Missouri-St. Louis and Washington University. This entry was posted on Saturday, March 30th, 2019 at 5:49 pm and is filed under April 2019. You can follow any responses to this entry through the RSS 2.0 feed. Responses are currently closed, but you can trackback from your own site.